BROOMFIELD, Colo., April 27, 2018 /PRNewswire/ -- Ball Corporation (NYSE: BLL) recently won two 2018 Euro CanTech Awards from CanTech International for its metallic Ball-branded aluminium aerosol deodorant can and beverage cans created for Heineken Serbia's Zaječarsko brand. 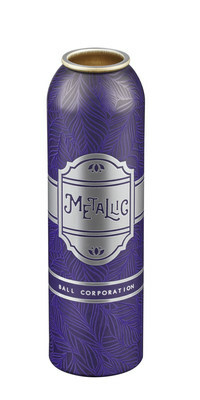 For the aerosol can, Ball developed a cost-effective, captivating solution for customers who want the look of hot stamping (where a metallic foil is applied to the can). Using state-of-the-art pigments and the company's unique ink application technology, a glossy, reflective sheen can be applied on aluminium cans of all shapes and sizes and is available in a range of metallic shades. For the beverage can, Ball partnered with Heineken Serbia, a long-standing customer, on an exclusive can design. Heineken created four limited edition cans, which showcase Ball's impeccable high-definition printing technique, for its Zaječarsko brand. Ball worked closely with Heineken to transfer four pieces of artwork from the Serbian National Museum onto cans for a unique collaboration that truly emphasizes Ball's unique design and graphics capabilities.